The depression during the 1990s included hyperinflation and a fall in economic output to less than half of the GDP of the preceding Ukrainian SSR. GDP growth was recorded for the first time in 2000, and continued for eight years. This growth was halted by the global financial crisis of 2008, but the Ukrainian economy recovered and achieved positive GDP growth in the first quarter of 2010. By October 2013, the Ukrainian economy lapsed into another recession. The previous summer Ukrainian export to Russia was substantially worsened due to stricter border and customs control by Russia. The early 2014 annexation of Crimea by Russia, and the War in Donbass that started in the spring of 2014 severely damaged Ukraine's economy and severely damaged two of the more industrial oblasts. In 2013, Ukraine saw zero growth in GDP. Ukraine's economy shrank by 6.8% in 2014, and this continued with a 12% decline in GDP in 2015. In April 2017 the World Bank stated that Ukraine's economic growth rate was 2.3% in 2016, thus ending the recession. The nation has many of the components of a major European economy – rich farmlands, a well-developed industrial base, highly trained labour, and a good education-system. As of 2014[update], however, the economy remains in poor condition. Geography has long influenced the economy of the Ukrainian lands. Rich fertile soils (such as chernozem areas) made the area a "breadbasket": for ancient Greece as well as for early modern Europe. The maintenance of trade corridors - the route from the Varangians to the Greeks and access through the Straits to the Mediterranean world - became important. Mineral resources encouraged industrialisation - notably in the Donbas - from the 19th century onwards. But the lack of secure borders meant repeated interruptions in economic development. Steppe nomads and other conquerors - Cumans, Mongols, Tatars and the Austro-Hungarian occupiers in 1917-1918, for example, sometimes saw plundering as more important than fostering economic development. In the 16th to 18th centuries, the waste lands of the Wild Fields left much of Ukraine as an area of tentatively militarised outposts prior to tsarist Russia's extension of its power into the region in the 17th and 18th centuries. For the history of Ukraine's economy in Soviet times, see Ukrainian Soviet Socialist Republic § Economy. On 24 August 1991 Ukraine established its independence from the Soviet Union. The new state's economy suffered huge output declines and soaring inflation in the following years. Ukraine saw hyperinflation in the early 1990s because of a lack of access to financial markets and massive monetary expansion to finance government spending, while output declined sharply. Huge output declines and soaring inflation was at the time common to most former Soviet republics; but Ukraine was among the hardest hit by these problems. In response to this hyperinflation the National Bank of Ukraine replaced the national currency, the karbovanets, with the hryvnia in September 1996 and pledged to keep it stable in relation to the US dollar. The currency remained unstable through the late 1990s, particularly during the 1998 Russian financial crisis. Deep recession during the 1990s led to a relatively high poverty rate, but beginning in 2001, as a result seven straight years of economic growth, the standard of living for most citizens increased. A World Bank report of 2007 noted: "Ukraine recorded one of the sharpest declines in poverty of any transition economy in recent years. The poverty rate, measured against an absolute poverty line, fell from a high of 32% in 2001 to 8% in 2005. The UN noted that Ukraine had overcome absolute poverty, and that there was only relative poverty in 2009. Ukraine stabilised by the early 2000s. The year 2000 saw the first year of economic growth (since (Ukraine's) independence). The economy continued to grow thanks to a 50% growth of exports between 2000 and 2008 - mainly exports from the traditional industries of metals, metallurgy, engineering, chemicals, and food. Between 2001 and 2008 metals and chemicals prices boomed because of fast international economic growth, while the price of natural gas imported from Russia remained low. Monetization also helped to drive the economic boom Ukraine experienced between 2000 and 2008. Attracted in part by relatively high interest-rates, foreign cash was injected[by whom?] into Ukraine's economy and money supply grew rapidly: from 2001 to 2010 broad money increased at an annual rate of 35%. In 2006 and 2007 credit growth averaged 73%. An effect of this was that Ukrainian assets began to look like a large economic bubble and high inflation started to damage Ukraine's export competitiveness. The ratio of credit to GDP grew extremely fast—from 7 to almost 80 percent over just several[quantify] years. From 2000 to 2007, Ukraine's real growth averaged 7.4%. This growth was driven by domestic demand: orientation toward consumption, other structural change, and financial development. Domestic demand grew in constant prices by almost 15% annually. It was supported by expansionary—procyclical—fiscal policy. Ukraine benefited from very low labor-costs, slightly lower tariffs, and high prices of its main export goods, but at the same time faced notably higher non-tariff barriers. Russia has not charged Ukraine below world market prices for natural gas since the end of 2008; this led to various Russia–Ukraine gas disputes. Ukraine suffered severely in the economic crisis of 2008; because of it Ukraine experienced a drought in capital flows. The hryvnia, which had been pegged at a rate of 5:1 to the U.S. dollar, was devalued to 8:1, and was stabilized at that ratio until the beginning of 2014. In 2008 Ukraine's economy ranked 45th in the world according to 2008 GDP (nominal), with a total nominal GDP of 188 billion USD, and nominal per-capita GDP of 3,900 USD. There was 3% unemployment at the end of 2008; over the first 9 months of 2009, unemployment averaged 9.4%. The final official unemployment rates over 2009 and 2010 were 8.8% and 8.4%, although the CIA World Factbook notes a "large number of unregistered or underemployed workers". Ukraine's GDP fell by 15% in 2009. The Ukrainian economy recovered in the first quarter of 2010 due to the recovery of the world economy and increasing prices for metals. Ukraine's real GDP growth in 2010 was 4.3%, leading to per-capita PPP GDP of 6,700 USD. In 2011 Ukrainian politicians estimated that 40% of the country's economy is shadow economy. In the summer of 2013 Ukrainian exports to Russia reduced substantially due to Russia's stricter customs controls. By October 2013 the Ukrainian economy became stuck in recession. Moody's put Ukraine's credit rating to Caa1 (poor quality and very high credit risk) in September 2013. At the time swap markets rated Ukraine's default probability over the next five years at 50 percent. In 2013 Ukraine saw no growth in GDP. Due to the loss of Ukraine's largest trading partner, Russia, over the annexation of Crimea in March 2014, and exacerbated by the War in Donbass which started in April 2014[nb 1] Ukraine's economy shrank by 6.8% in 2014; it had been expected to decline by 8%. The annexation of Crimea by Russia also contributed directly to this shrinkage. A Ukrainian Government report stated early in February 2016 that Ukraine's economy had shrunk by 10.4% in 2015. For 2015 the National Bank of Ukraine had expected a further decline of 11.6%, and the World Bank anticipated a 12% shrinkage. The World Bank forecast a growth of 1% in 2016. Early in February 2014 the National Bank of Ukraine changed the hryvnia into a fluctuating/floating currency in an attempt to meet IMF requirements and to try to enforce a stable price for the currency in the Forex market. In 2014 and 2015 the hryvnia lost about 70% of its value against the U.S. dollar. The IMF agreed to a four-year loan program worth about $17.5 billion in eight tranches over 2015 and 2016, subject to conditions which involved economic reforms. However, due to lack of progress on reforms, only two tranches worth $6.7 billion were paid in 2015. A third tranche of $1.7 billion was provisionally scheduled in June 2016 subject to the bringing into law of 19 further reform measures. Some[quantify] western analysts believe that large foreign loans are not encouraging reform, but enabling the corrupt extraction of funds out of the country. Since December 2015 Ukraine has refused to pay and hence de facto defaults on a $3 billion debt payment to Russia that formed part of a December 2013 Ukrainian–Russian action plan. The turnover of retail trade in Ukraine in 2014 shrank by 8.6% (from 2013) and shrank by 20.7% in 2015 (from 2014). Ukraine saw a 30.9% decline in exports in 2015. - mainly because of a sharp decline in production output in Donetsk Oblast and in Luhansk Oblast (the two regions of Donbass). These two regions were responsible for 40.6% of the total export-decline rate. Before the war they had been two of the more industrial oblasts of Ukraine. According to the Ministry of Economic Development and Trade, Ukraine had a surplus in its balance of payments in January–November 2015 of $566 million and has had a trade deficit of $11.046 billion during the same period in 2014. On 31 December 2015 Ukraine's public debt stood at 79% of its GDP. It had shrank $4.324 billion in 2015 to end up at $65.488 billion. But calculated in hryvnia the debt had grown 42.78%. In 2015 the Ministry of Social Policy of Ukraine rated 20-25% of Ukrainian households as poor. $2.526 billion entered the Ukrainian economy via remittances in 2015, 34.9% less than in 2014. $431 million was sent from Ukraine to elsewhere using remittances. In January 2016, the US company Bloomberg rated Ukraine's economy as the 41st most-innovative in the world, down from 33rd in January 2015. In May 2016, the IMF mission chief for Ukraine, Ron van Rood, stated that the reduction of corruption was a key test for continued international support. In 2015 Transparency International ranked Ukraine 130th out of 168 countries in its Corruption Perceptions Index. In February 2016 historian Andrew Wilson assessed progress in reducing corruption as poor as of 2016. Aivaras Abromavicius, Ukraine's then Minister of Economy and Trade, resigned in February 2016, citing ingrained corruption. In October at a conference for foreign investors, corruption and lack of trust in the judiciary were identified[by whom?] as the largest obstacles to investment. Late in July 2016 the State Statistics Service of Ukraine reported that, compared with June 2015, real wages had increased by 17.3%. Simultaneously the National Bank of Ukraine reported a $406 million surplus in Ukraine's January–June 2016 balance of payments against a deficit of $1.3 billion in the same period in 2015. According to Ukraine's State Statistics Service, inflation in 2016 came down to 13.9%; while it had stood at 43.3% in 2015 and at 24.9% in 2014. The Economist has compared the severity of Ukraine's recession to that of the Greek recession in 2011-2012 - pointing to Ukraine experiencing an 8-9% decline in GDP from 2014-2015 and Greece experiencing an 8.1% decline of GDP in 2011-2012, and noted that not all areas of Ukraine were equally effected by the economic downturn. Donetsk and Luhansk (located at the epicenter of the conflict zone) saw industrial production falling by 32% and 42% respectively. On the other hand, Lviv, located over 1000 km from the conflict, posted the largest jump in employment in the nation. The economy of Ukraine overcame[when?] the severe crisis caused by armed conflict in the eastern part of country. A 200% devaluation of the Ukrainian hryvnia (national currency) in 2014-2015 made Ukrainian goods and services cheaper and more сompetitive. In 2016, for the first time since 2010, the economy grew by more than 2%. A 2017 World Bank statement projected growth of 2% in 2017, of 3.5% in 2018 and of 4% in 2019 and 2020. Inflation in Ukraine in 2017 was 13.7% (12.4% in 2016). According to IMF calculations in 2020 Ukraine will have gross external financing needs of $46 billion, which is about 34 percent of GDP. Ukraine is subdivided into nine economic regions: Carpathian, Northwestern, Podillia, Capital, Central-Ukrainian, Northeastern, Black-Sea-Coastal, Trans-Dnipro, and Donetsk. Those regions were redrawn from the three Soviet economic regions of the Ukrainian SSR: Donetsk-TransDnieper, Southwestern, and Southern. Until recently, Russia[nb 2] was Ukraine's largest trading partner with 25.7% of exports and 32.4% of imports in 2012. In 2012, 24.9% of exports and 30.9% of imports were to and from the EU. In 2013, 35.9% of Ukrainian exports went to CIS countries, including eight countries other than Ukraine. Simultaneously, exports to EU countries, of which there are twenty-eight, was 26.6%. By 2015 the EU became Ukraine's largest trading partner, accounting for more than a third of its trade. In 2015 the Ukrainian export to Russia figure had fallen to 12.7%. In 2017 Ukraine imported 14.5% of all its imports from Russia. In 2017 the Ukrainian export to Russia figure was 9%. In 2017 40% of Ukraine's export went to the EU and 15% to CIS countries. Overall Ukraine increased its exports by 20% in 2017. Albeit the growth of imports was faster than the rate of exports boost. In 2015, food and other agricultural products (worth $13 billion), metallurgy ($8.8 billion) and machinery ($4.1 billion) made up most of the Ukraine's exports with trade partners from 217 countries. Exports from Ukraine in 2015 decreased by 29.3% to $38.135 billion and imports were 31.1% down, to $37.502 billion. In 2017 almost half of Ukraine's export was provided by the agrarian complex and food industry, slightly more than 20% by metallurgy and nearly 10% by machine-building products. Natural gas is Ukraine's biggest import and the main cause of the country's structural trade deficit. Ukraine's "business climate" has a very negative reputation. Ukraine is relatively rich in natural resources, particularly in mineral deposits. Although oil and natural gas reserves in the country are largely exhausted, it has other important energy sources, such as coal, hydroelectricity and nuclear fuel raw materials. In Ukraine covering about 20 major industries, namely power generating, fuel, ferrous and non-ferrous metallurgy, chemical and petrochemical and gas, machine-building and metal-working, forest, wood-working and wood pulp and paper, construction materials, light, food and others. Industry accounted for 26% of GDP in 2012. The country possesses a massive high-tech industrial base, including electronics, arms industry and space program. Ukraine is one of the world's most important mineral producing countries, in terms of both the range and size of its reserves. There are nearly 8,000 separate deposits, harboring some 90 different minerals, of which about 20 are economically significant. About half of all the known deposits are under exploitation. Coal reserves in Ukraine amount to 47.1 billion tons. The annual domestic demand for coal as fuel is about 100 million tons, of which 85 percent can be satisfied by domestic production. Ukraine has oil and gas fields that meet 10 percent of her oil and 20 percent of her gas consumption, respectively. Ukraine contains natural gas reserves of 39.6 trillion cubic feet, but only about 20 percent of the country's demand is met by domestic production. Deposits of iron ore (estimated at 28 billion tons), manganese ore (3 billion tons), chalk and limestone (1.5 billion tons) are also large in Ukraine. The domestic industrial sector suffers from constant energy shortages and energy supply payment debts totaling about $792 million at the end of 1995. Ukraine is rich in mineral deposits, including iron ore (of which it once produced 50 percent of the entire Soviet output), manganese ore (of which it produced 40 percent of world output during the Soviet era), mercury, titanium, and nickel. Ukraine has a major ferrous metal industry, producing cast iron, steel and pipes. Among its economy leading companies in that field are Metinvest, Kryvorizhstal, AzovStal, Ilyich Steel & Iron Works, and others. As of 2012, Ukraine is the world's tenth largest steel producer (according to World Steel Association). Another important branch is the country's chemical industry which includes the production of coke, mineral fertilizers and sulfuric acid. Ukraine's defense industry is organized around Ukroboronprom, a state owned conglomerate of over 130 companies. These companies include Soviet era giants such as Ivchenko-Progress aircraft design bureau that was opened in 1945, to newer companies such as RPC Fort which came into existence in the 1990s. 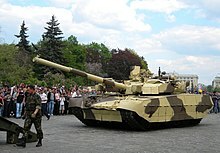 Ukraine is also among the top 10 arms exporters in the world. The signing of recent large contracts may put Ukraine into 6th place among biggest arms traders, after the United States, Russian Federation, France, Germany and Israel. The output of Ukrainian defense plants grew 58% in 2009, with largest growth reported by aircraft builders (77%) and ship builders (71%). In 2013 Ukraine's defense sector manufactured a total of 11.7 billion UAH worth of goods, 10 billion UAH of which were exported. In the first 9 months of 2014 Ukraine's defense sector produced a record 13 billion UAH worth of goods, the increase was largely due to government orders for the War in Donbass. Ukraine imports 90% of its oil and most of its natural gas. Russia ranks as Ukraine's principal supplier of oil, and Russian firms own and/or operate the majority of Ukraine's refining capacity. Natural gas imports come from Russia - which delivers its own gas, as well as the gas from Turkmenistan. Ukraine transports Russian gas to the EU through its well-developed gas pipelines system, being Europe's vitally important connection. The country's dependence on Russian gas supplies dramatically affects its economics and foreign policy, especially after the 2014 Russia–Ukraine gas disputes. However, Ukraine is independent in its electricity supply, and exports to Russia and other countries of Eastern Europe. This is achieved through a wide use of nuclear power and hydroelectricity. Recent energy strategy intends gradual decreasing of gas- and oil-based generation in favor of nuclear power, as well as energy saving measures including lower industrial gas consumption. Reform of the still inefficient and opaque energy sector is a major objective of the International Monetary Fund (IMF) and World Bank programs with Ukraine. Ukraine is a partner country of the European Union|EU INOGATE energy programme, which has four key topics: enhancing energy security, wikt:convergence|convergence of member state energy markets on the basis of Internal energy market|EU internal energy market principles, supporting sustainable energy development, and attracting investment for energy projects of common and regional interest. Ukraine automobile manufacturers produces diesel locomotives, tractors, trucks, buses, trolleybuses, own-designed cars and trams. There are 12 automobile manufacturers in Ukraine includes ZAZ, LuAZ, Bogdan, KrAZ, Eurocar, Electron, LAZ. ZAZ (Zaporizhia Automobile Building Plant) is the main automobile-manufacturer of Ukraine, based in the south-eastern city of Zaporizhia. Beginning of passenger cars manufacturing in Ukraine started in 1959. From 1960 to 1994, a total of 3,422,444 Zaporozhets vehicles were manufactured in Zaporizhia and engines with air-cooling in Melitopol. In 2011-2012, Zaporizhia Automobile Building Plant started serial full-scale production of two new models of vehicle, the ZAZ Forza and the ZAZ Vida. Bogdan Corporation is a leading Ukrainian automobile-manufacturing group, including several car- and bus-makers of the country. Bogdan buses are used as the primary small buses in most Ukrainian cities. LAZ is one of the major bus manufacturers in Ukraine. It manufactures city buses, coach buses, trolley buses, and special purpose buses. The Lviv-based company Electrontrans is an enterprise of a full-scale production, specializing in design and production of modern urban electric transport – trams, trolleybuses, electric buses, units and spare parts. In 2013 Electrotrans starts producing low-floor trams, the first Ukrainian 100% low-floor tramways. Ukraine is one of nine countries with a full cycle of aerospace hardware engineering and production. Besides to design and production of passenger and transportation aircraft, Ukraine also boasts a network of aircraft repair enterprises, including companies involved in recovery of military planes and helicopters. In March 2007, the Cabinet of Ministers of Ukraine created State aircraft building concern «Aviation of Ukraine» (SACAU), which is governed by the Ministry of industrial policy. Production of An-148 aircraft is now one of the most prospective projects for Ukrainian plane manufacturing industry with 35 units manufactured since 2009 (together with Russian production). The aircraft were engineered by Antonov Scientific and Production Complex Design Office (Antonov ANTK). The largest single airplane in the world, Antonov An-225 Mriya was also designed by Antonov ANTK and made in 1988. Gross production of light and ultra light planes in Ukraine does not exceed 200 units per annum. Production of hang-gliders and paragliders of all designs makes nearly 1,000 units each year. Most of produced devices are exported (the buyers of Ukrainian-made ultra light aircraft are the United States, Australia, New Zealand, the United Kingdom, France, etc.). Since the Ukrainian crisis, aerospace industry revenues have fallen by 80%. In June 2016, the Antonov Corporation merged with the state-owned military conglomerate UkrOboronProm, forming Ukrainian Aircraft Corporation within its structure. This merger was done in order to boost Antonov profits and the production rate. Currently, Antonov is working on two cargo planes: An-178, a cargo version of An-158, and An-132D, a redesigned version of An-32. The An-132 is developed jointly with Saudi's Taqnia Aeronautics Company, featuring western avionics and engines. The roll out and first flight is due at the beginning of January 2017. The space rocket industry in Ukraine has been managed by the National Space Agency of Ukraine since 1992. The agency includes 30 enterprises, scientific research institutes, and design offices. Pivdenne Design Bureau is in general responsible for creating the Zenit-3SL carrier rocket. The National Space Agency of Ukraine is involved in cooperation with American Rockwell Int., as well as the Sea Launch project. The first stage core of the U.S. Orbital ATK Antares rocket was designed and is manufactured in Ukraine by Yuzhnoye SDO. The USSR's collapse put Ukraine's shipbuilding into a long-term decline. It lasted until 1999 and was mostly due to a minimum volume of state shipbuilding orders. In general, between 1992 till 2003, the 11 shipyards of the country produced 237 navigation units for a total value of USD 1.5 billion. Production facilities are not working near full capacity, and customers are not always timely in paying for services. Growth of production volumes was witnessed at the enterprises of shipbuilding industry over 2000-2006. State support and the opening of free economic zones, foremost at enterprises based in Mykolaiv were of crucial recent developments in Ukraine's shipbuilding industry. Within the Mykolaiv Special Economic Zone, enterprises like Damen Shipyards Okean, Chornomorskyi (Black Sea) Shipbuilding Plant, 61 Communards Shipbuilding Plant, as well as the Veselka (Rainbow) paint and insulation enterprise are implementing investment projects targeted to raise efficiency and quality in primarily export-oriented vessel building through production upgrades. The new engineering developments and high potential of Ukrainian designers give ability to build high quality vessels with competitive prices. There are 49 shipbuilding companies registered in Ukraine. They are able to build a wide range of vessel types: powerboats, barges, bulk carriers (dry cargo ship), tankers, liquefied gas carriers, etc. Ukraine is one of the 10 largest shipbuilding countries in Europe. Ukrainian T-150K tractor build by Kharkiv Tractor Plant. Although typically known as the industrial base of the Soviet Union, agriculture is a large part of Ukraine's economy. In 2008 the sector accounted for 8.29% of the country's GDP and by 2012 has grown to 10.43% of the GDP. Agriculture accounted for $13.98 billion value added to the economy of Ukraine in 2012, however despite being a top 10 world producer of several crops such as wheat and corn Ukraine still only ranks 24 out of 112 nations measured in terms of overall agricultural production. Ukraine is the world's largest producer of sunflower oil, a major global producer of grain and sugar, and future global player on meat and dairy markets. It is also one of the largest producers of nuts. Ukraine also produces more natural honey than any other European country and is one of the world's largest honey producers, an estimated 1.5% of its population is involved in honey production, therefore Ukraine has the highest honey per capita production rate in the world. Because Ukraine possesses 30% of the world's richest black soil, its agricultural industry has a huge potential. However, farmland remains the only major asset in Ukraine that is not privatized. The agricultural industry in Ukraine is already highly profitable, with 40-60% profits, but according to analysts its outputs could still rise up to fourfold. Ukraine's flag resembles the nation's farmlands. Ukraine is the world's 6th largest, 5th if not including the EU as a separate state, producer of corn in the world and the 3rd largest corn exporter in the world. In 2012 Ukraine signed a contract with China, the world's largest importer of corn, to supply China with 3 million tonnes of corn annually at market price, the deal also included a $3 billion line of credit extension from China to Ukraine. In 2014 Ukraine total grain crop was estimated to be record 64 million metric tons. However, in 2014 several regions have declared (themselves) independence (and are no longer under control of Ukrainian central authorities) resulting in the War in Donbass and the Crimea Crisis[nb 3], hence the actual available crop yield was closer to 60.5 million metric tons. By October Ukrainian grain exports reached 11 million metric tons. Due to the decline of the metallurgy industry, Ukraine's top export in prior years, as a result of the War in Donbass agricultural products accounted for the nation's largest exported set of goods. Ukraine has a long-standing reputation as a major technology region, with a well-developed scientific and educational base. In March 2013 Ukraine ranks fourth in the world in number of certified IT professionals after the United States, India and Russia. On top of that, the experts recognize both quantitative and qualitative potential of the Ukrainian specialists. In 2011 the number of IT specialists working in the industry reached 25,000 people with 20% growth. The volume of the Ukrainian IT market in 2013 was estimated to be up to 3.6 billion US dollars. About 100,000 Ukrainians regularly work on foreign merchant ships, one of the largest group of Ukrainian labor migrants and the sixth largest number of sailors from any country. They are attracted by the relatively high salaries of more than $1,000 per month. Every major Ukrainian coastal city has a maritime university. Ukraine ranks eighth among the world's nations in terms of the Internet speed with the average download speed of 1,190 kbit/s. Five national providers of fixed (DSL, ADSL, XDSL) internet access — Ukrtelecom, Vega Telecom, Datagroup, Ukrnet, Volia, and 5 national operators of mobile internet — MTS, Kyivstar, PEOPLEnet, Utel, and Intertelecom are currently operating in Ukraine. Every regional center and large district center has a number of local providers and home networks. Over 16 million Ukrainians had Internet access in 2012, growing to 22 million in 2015. In Kiev 90% of the population had internet access. The mobile-cellular telephone system's expansion has slowed, largely due to saturation of the market which has reached 144 mobile phone subscriptions per 100 people. Ukraine is the 8th most popular tourism destination in Europe with 23 million visitors in 2012. The country's tourism industry is generally considered to be underdeveloped, but it does provide crucial support for Ukraine's economy. In 2012, the contribution of tourism to the GDP amounted to 28.8 billion ₴, or 2.2% of GDP and directly supported 351,500 jobs (1.7% of total employment). Ukraine's neighbours (Poles, Slovaks, Hungarians, Belarusians and even Russians) are known to come to Ukraine to purchase products and presents, such as food or gasoline, that are cheaper in Ukraine than in their home countries. Ukraine has impressive landscapes, ruins of ancient castles, historical parks, vineyards where they produce native wines, unique structures such as Saint Sophia Cathedral or Chersonesos. Officially, there are seven World Heritage Sites in Ukraine. The Carpathian Mountains suitable for skiing, hiking, fishing and hunting. Bukovel — is the largest ski resort in Ukraine situated in the Ivano-Frankivsk Oblast (province) of western Ukraine. The 2010-2011 winter season recorded 1,200,000 day visits with foreigners amounting to 8-10% of all visitors. In 2012 the Bukovel was named the fastest growing ski resort worldwide. The coastline on the Black Sea is a popular summer destination for vacationers, especially Odessa. A political crisis in the middle of 2006 was feared as a threat to economic and investment stability, however, despite the forecasts, the political situation has not scared investors. The GDP showed a good growth rate of 7% in 2007, compared to the previous year. Industrial output has increased. Car sales soared, while the banking sector has expanded, thanks to the arrival of European banks. In 1992, Ukraine became a member of the IMF and the World Bank. It is a member of the European Bank for Reconstruction and Development. In 2008, the country joined World Trade Organization. Ukraine applied for WTO membership in 1993, but its accession process was stalled for 15 years. Ukraine encourages foreign trade and investment. The Parliament of Ukraine has approved a foreign investment law allowing foreigners to purchase businesses and property, to repatriate revenue and profits, and to receive compensation if the property is nationalized by a future government. However, complex laws and regulations, poor corporate governance, weak enforcement of contract law by courts, and corruption all continue to stymie direct large-scale foreign investment in Ukraine. While there is a functioning stock market, the lack of protection of shareholders' rights severely restricts portfolio investment activities. As of April 2011 total foreign direct investment stock in Ukraine stood at $44.7 billion. Statistics from FDi Magazine show Ukraine suffered a year on year decline in foreign direct investment between 2010 and 2013. State enterprise InvestUkraine was created under the State Agency for Investment and National Projects (National Projects) to serve as a One Stop Shop for investors and to deliver investment consulting services. Ukraine signed a shale gas exploration deal with Royal Dutch Shell on 25 January 2013. The $10 billion deal was the largest foreign direct investment ever for Ukraine. Many companies, owned by foreigners, have been successfully operating in Ukraine since its independence. These include companies in agriculture, such as Kyiv-Atlantic Group, founded in 1994 by David Sweere. He sold its business in Minnesota and invested in Ukraine, believing in its huge potential. The company has been operating at a profit since 2002. As a result, he became the fifth richest among the Westerners who made their fortune in Ukraine. In 2016, foreign direct investment in Ukraine's economy amounted to $3.8 billion in 2016, which was almost twice more than in 2015. According to the Global Competitiveness Report 2012-2013 "the country’s most important challenge is the needed overhaul of its institutional framework, which cannot be relied on because it suffers from red tape, lack of transparency, and favoritism". Since the late 1990s, the government has pledged to reduce the number of government agencies, streamline the regulatory process, create a legal environment to encourage entrepreneurs, and enact a comprehensive tax overhaul. Outside institutions — particularly the International Monetary Fund — have encouraged Ukraine to quicken the pace and scope of reforms and have threatened to withdraw financial support. But reforms in some politically sensitive areas of structural reform and land privatizations are still lagging. On June 24, 2010 Ukraine's Foreign Minister Kostyantyn Hryshchenko signed an agreement on free trade with the European Free Trade Association (EFTA). According to specialists, a double taxation avoidance treaty with Cyprus (signed in 1982 by the Soviet Union) has cost Ukraine billions of US dollars of tax revenues. The recent Lustration in Ukraine has been criticized as it might have adverse economic effects. A number of foreign guest workers come to work in Ukraine, mainly in seasonal farm work and construction industry, especially from neighboring Moldova and Belarus. Ukraine is interested in cooperating on regional environmental issues. Conservation of natural resources is a stated high priority, although implementation suffers from a lack of financial resources. Ukraine established its first nature preserve, Askania-Nova, in 1921 and has programs to breed endangered species. The country has significant environmental problems, especially those resulting from the Chernobyl nuclear power plant disaster in 1986 and from industrial pollution. In accordance with its previously announced plans, Ukraine permanently closed the Chernobyl Atomic Energy Station in December 2000. In November 2001, Ukraine withdrew an application it had made to the EBRD for funding to complete two new reactor units to compensate for the energy once produced by Chernobyl. Ukrainian concern over reform conditions attached to the loan - particularly tariff increases needed to ensure loan repayment—led the Ukrainian government to withdraw the application on the day the EBRD Board was to have considered final approval. Work on the so-called "object shelter" to permanently entomb the reactor where the world's worst nuclear accident occurred has been slower than anticipated but continues. Design work as well as structural improvements to the "sarcophagus" erected by the Soviet Union are largely complete, and construction on the new shelter was scheduled to begin in 2004. Ukraine also has established a Ministry of Environment and has introduced a pollution fee system that levies taxes on air and water emissions and solid waste disposal. The resulting revenues are channelled to environmental protection activities, but enforcement of this pollution fee system is lax. ^ In April 2014 pro-Russian protest escalated into the War in Donbass between the Ukrainian government and the separatist forces of the self-declared Donetsk People's Republic and Luhansk People's Republic. ^ Both Russia and Ukraine were part of the Soviet Union since 1920 till Ukraine declared its independence from the Soviet Union on 24 August 1991, and before 1917 they were both part of the Russian Empire. ^ Crimea is currently under dispute by Russia and Ukraine. ^ The data for the 2009 fiscal year is missing due to the fact that State Statistics Service of Ukraine is transitioning for the international standards of accounting. ^ a b c d e f g "The World Factbook". CIA.gov. Central Intelligence Agency. Retrieved 23 March 2019. ^ "GINI index (World Bank estimate)". data.worldbank.org. World Bank. Retrieved 14 March 2019. ^ "Ease of Doing Business in Ukraine". Doingbusiness.org. Retrieved 2018-11-21. ^ a b c Sarna, Arkadiusz (15 July 2013). "Kyiv's gas strategy: closer cooperation with Gazprom or a genuine diversification". Centre for Eastern Studies. Archived from the original on 23 October 2013. ^ , National Bank of Ukraine Retrieved 18 June 2018. ^ "Report for Selected Countries and Subjects". IMF.org. International Monetary Fund. 2017. Retrieved 21 December 2018. ^ Rogers, Simon; Sedghi, Ami (15 April 2011). "How Fitch, Moody's and S&P rate each country's credit rating". The Guardian. ^ a b Russia sets off trade war to prevent Ukraine from signing agreement with EU, says UDAR. Kyiv Post. 14 August 2013. "Ukraine Leader Ignores Putin Warning on EU Path". Voice of America. 24 August 2013. Retrieved 1 September 2013. "Russia hits at Ukraine with chocolate war". EurActiv. 14 August 2013. Retrieved 1 September 2013. "Trading insults". The Economist Newspaper. 24 August 2013. Retrieved 1 September 2013. "Putin warns Ukraine against EU pact". euobserver. 23 August 2013. Retrieved 1 September 2013. "Ukraine PM tells Russia to accept "reality" of EU trade deal". Reuters. 28 August 2013. Retrieved 1 September 2013. "Putin 'deserves medal' for pushing Ukraine towards EU". Euractiv. 30 August 2013. Retrieved 1 September 2013. "О комплексе мер по вовлечению Украины в евразийский интеграционный процесс". Зеркало недели. Украина. 16 August 2013. Retrieved 1 September 2013. ^ a b c d Leonard, Peter (14 April 2014). "Ukraine to deploy troops to quash pro-Russian insurgency in the east". Yahoo News Canada. Associated Press. Archived from the original on 14 April 2014. Retrieved 26 October 2014. ^ a b "Ukraine economy expected to shrink 8%". Yahoo. 2 Oct 2014. ^ "Ukraine becomes world's third biggest grain exporter in 2011 – minister" (Press release). Black Sea Grain. 20 January 2012. Archived from the original on 4 March 2014. Retrieved 3 September 2015. ^ Kaplan, Temma (2014). Democracy: A World History. New Oxford World History. New York: Oxford University Press. ISBN 9780199929962. Retrieved 2018-11-09. Greece consisted of discrete enclaves on which agriculture was difficult and residents turned to the sea for their livelihood. [...] Athens could not have survived without grain from Ukraine, one reason that Athens feared Persian movements toward the Dardanelles, the Bosporus, and the Black Sea, and maybe the main reason Athens extended so many rights of participatory democracy to lower-class male citizens who served in its navy. ^ Havrylyshyn, Oleh (2016). "Nature of the Economy before Independence". The Political Economy of Independent Ukraine: Slow Starts, False Starts, and a Last Chance?. Studies in Economic Transition. London: Springer. p. 18. ISBN 9781137576903. Retrieved 2018-11-09. From the mid-1500s one saw the second historical period of European orientation as 'increasing demand for grain on the European markets [led to] Ukraine earning its reputation as the breadbasket of Europe'. ^ Havrylyshyn, Oleh (2016). "Nature of the Economy before Independence". The Political Economy of Independent Ukraine: Slow Starts, False Starts, and a Last Chance?. Studies in Economic Transition. London: Springer. p. 24. ISBN 9781137576903. Retrieved 2018-11-09. In the 1860s and 1870s a major shift in economic structure began as czarist policy turned to promote modern industrialization [...]. [...] A huge government-supported program of railroad building began, followed by policies to attract foreign investors to develop metallurgy in the coal- and iron-rich areas of the South-East. ^ "Verkhovna Rada of Ukraine Resolution On Declaration of Independence of Ukraine". Verkhovna Rada of Ukraine. 24 August 1991. Archived from the original on 2007-09-30. Retrieved 12 September 2007. ^ "Ukraine and Russia reach gas deal". BBC news. 4 January 2006. Retrieved 17 December 2008. ^ "Ratings Definitions". moodys.com. Moody's Investors Service. 2011. Retrieved 30 August 2011. ^ "Report on the Activities of Credit Rating Agencies" (PDF). The Technical Committee of the International Organization of Securities Commissions. September 2003. Retrieved 1 December 2011. ^ 7 лютого 2014 року Національний банк України вводить в обіг пам'ятну монету 'Визволення Нікополя від фашистських загарбників' [7 February 2014 the National Bank of Ukraine will introduce a commemorative coin 'Liberation of Nikopol from fascist invaders' into circulation] (in Ukrainian). 7 February 2014. Archived from the original on 21 February 2014. ^ "Ukraine may get USD 1.7 bln from IMF by mid-year - Moody's". Ukraine Today. 13 May 2016. Retrieved 20 May 2016. ^ "What Ukraine must do to get another $1.7 billion IMF loan". Kyiv Post. 14 May 2016. Retrieved 20 May 2016. ^ a b Alessandra Prentice (18 May 2016). "Ukraine, IMF agree terms to resume financial support - IMF". Reuters. Retrieved 20 May 2016. ^ Neil A. Abrams, M. Steven Fish (5 May 2016). "How Western aid enables graft addiction in Ukraine". Washington Post. Retrieved 20 May 2016. ^ Vasileva, Nataliya (18 December 2015). "Ukraine won't repay $3 billion Russian debt due this weekend". Moscow. AP News. Archived from the original on 11 March 2016. Retrieved 4 February 2016. ^ These Are the World's Most Innovative Economies Bloomberg Business. ^ Most Innovative: Countries Bloomberg Business. ^ "Corruption by Country: Ukraine". Transparency International. 2015. Retrieved 17 February 2016. ^ Andrew Wilson (14 February 2016). "Corruption is Stalling Ukraine's Optimistic Revolution". Newsweek. Retrieved 17 February 2016. ^ Alec Luhn (4 February 2016). "Economic minister's resignation plunges Ukraine into new crisis". The Guardian. Retrieved 16 March 2016. ^ "Ukraine sets sights on foreign investment". euronews. 11 October 2016. Retrieved 11 October 2016. ^ "The Ukrainian economy is not terrible everywhere". The Economist. ^ Thor, Anatoliy. "Investing in Ukraine". ^ Валовий внутрішній продукт України в 2017 р. ^ Hajda, Lubomyr. "Ukraine". Encyclopædia Britannica. Encyclopædia Britannica, inc. Retrieved March 1, 2018. ^ "Укроборонпром за 9 месяцев изготовил продукции больше, чем за весь прошлый год". Ukrinform. Archived from the original on 10 August 2015. Retrieved 21 October 2014. ^ Nicolai Petro (9 March 2016). "Why Ukraine needs Russia more than ever". The Guardian. Retrieved 7 September 2016. ^ Bergin, Chris (February 25, 2008). "none". Space News. p. 12. ^ "Ukraine Agriculture Stats". Nation Master. ^ "Corn Production by Country in 1000 MT". Index Mundi. ^ "Ukraine Produces World's Greatest Amount of Honey Per Capita". WNU. August 2013. ^ "Ukraine agrees $3bn loan-for-corn deal". Financial Times. 19 Sep 2012. ^ "China Rejecting U.S. Corn as First Shipment From Ukraine Arrives". Bloomberg. 6 Jan 2014. ^ Gutterman, Steve. "Putin signs Crimea treaty, will not seize other Ukraine regions". Reuters.com. Retrieved 2014-03-26. ^ "Ukraine Grain Exports To Rise". Agriculture.com. ^ "World Development Indicator Ukraine". ^ "Mobile cellular subscriptions (per 100 people)". The World Bank. Retrieved 19 May 2017. ^ USA, IBP (2012-03-03). Ukraine Country Study Guide Volume 1 Strategic Information and Developments. Lulu.com. ISBN 9781438775838. ^ "Ukraine suffers year-on-year FDI decline". fDiIntelligence.com. 13 August 2013. ^ "Exposed: Ukraine's Massive Witch Hunt". February 26, 2015. Retrieved October 14, 2017. ^ a b c "Ukraine". CIA World Factbook. May 14, 2008. Retrieved 2008-05-14. ^ "Ukraine". State Statistics Service of Ukraine. 14 February 2009. Archived from the original on 15 September 2002. Retrieved 14 February 2009. The economy of Georgia is an emerging free market. 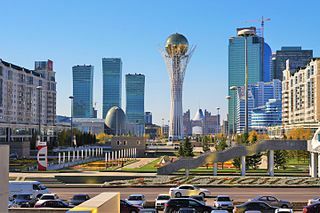 Its gross domestic product fell sharply following the collapse of the Soviet Union but recovered in the mid-2000s, growing in double digits thanks to the economic and democratic reforms brought by the peaceful Rose Revolution. Georgia continued its economic progress since, "moving from a near-failed state in 2003 to a relatively well-functioning market economy in 2014". In 2007, the World Bank named Georgia the World's number one economic reformer, and has consistently ranked the country at the top of its ease of doing business index. Russia has an upper-middle income mixed and transition economy with state ownership in strategic areas of the economy. Market reforms in the 1990s privatized much of Russian industry and agriculture, with notable exceptions to this privatization occurring in the energy and defense-related sectors. The Visegrád Group, Visegrád Four, or V4 is a cultural and political alliance of four Central European states – the Czech Republic, Hungary, Poland and Slovakia, that are members of the European Union (EU) and NATO – for the purposes of advancing military, cultural, economic and energy cooperation with one another along with furthering their integration in the EU. Ukraine was hit heavily by the late-2000s recession, the World Bank expects Ukraine's economy to shrink 15% in 2009 with inflation being 16.4%.